San Diego Foam Parties are the hot new thing! 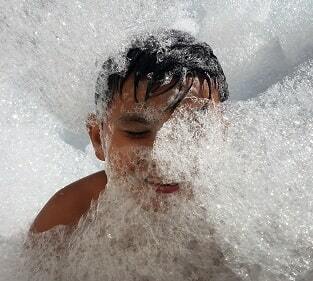 A guaranteed hit for your next event, our Foam Machines will produce piles and piles foamy bubbles in just a few minutes! We use only organic, hypoallergenic, non-toxic foaming agent to produce a safe yet super fun play environment! We can set the foam party on most surfaces, or you can rent our Inflatable Foam Pit to contain the sudsy fun. You can see our Foam Machine Parties all over San Diego: At school carnivals, church festivals and backyard parties. Includes enough foam solution to last 2 hours. Each additional hour purchased includes extra foam solution. Capacity: 15 in Foam Pit - up to 50 without. Minimum space: 24L x 24W x 6H with Foam Pit - 50L x 50W without. Water Outlet: 1 spigot with standard water pressure (40-45psi) within 50ft. Surface: Cannot be set up on dirt, rocks, sand or within 10ft of pools.